Zion Williamson proved he's back and healthy with a dominating three-game show at the Atlantic Coast Conference Tournament. That has fifth-ranked Duke celebrating yet another championship in its already-record haul. Zion Williamson proved he's back and healthy with a dominating three-game show at the Atlantic Coast Conference Tournament. And that has fifth-ranked Duke celebrating yet another championship in its already-record haul. 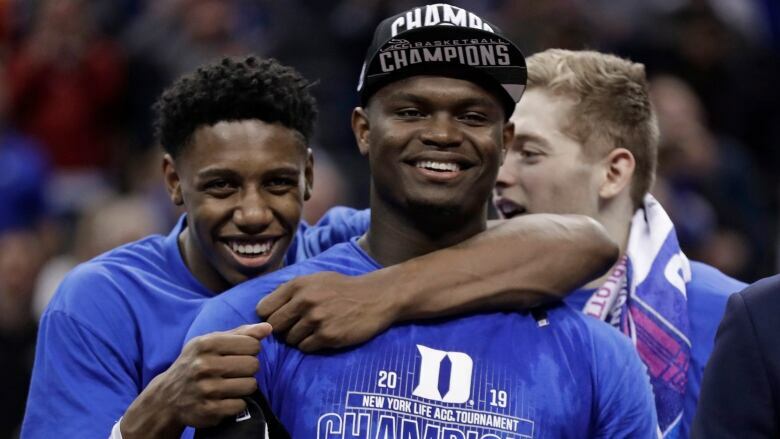 Williamson had 21 points to help the Blue Devils beat Florida State 73-63 on Saturday night in the championship game, giving Duke its 21st tournament title and sending the Blue Devils charging into the NCAA Tournament. Williamson was named the tournament's most valuable player, becoming only the sixth freshman to win the award and the first in a dozen years. "We're freshman and you think you're going to come in and dominate," Williamson said. "But for us to actually come this far and win says a lot about how much we want to win." Florida State's Terance Mann said Williamson's return made a huge difference for Duke inside. "They had 42 points in the paint," Mann said. "So his ability to score in the paint and get offensive putbacks changes their game a lot. If they do have a bad shooting day, they can still score down low." RJ Barrett added 17 points and nine rebounds and the Blue Devils (29-5) took control after halftime, while point guard Tre Jones had his own strong outing with 18 points and six assists — all part of Duke's closing act that showed the Blue Devils are ready for what's ahead. "I told them last night: `We've won a lot of championships but I haven't won one with you,"' Krzyzewski said during the trophy presentation. "So to be in their moment is the very best thing." He didn't need to do as much this time, with Duke putting four players in double figures and shooting 58 percent after the break to a 36-all score into a 14-point lead by midway through the half. Mfiondu Kabengele of Burlington, Ont., scored 14 points for the Seminoles (27-7). They upset No. 2 Virginia in Friday's semifinals but couldn't recover after falling behind big, getting no closer than five again.